This Jason Matthews article first appear at TheBookDesigner. At a recent writers conference I listened to a lecture from Laurie McLean of Foreword Literary, an agent I admire. She discussed the challenges of getting published and how writers can increase their chances by building a stronger author platform using social media and other tools. During the talk Laurie said something along the lines of, “At the very least, new authors should be blogging,” which was followed by a moment of silence from hundreds of aspiring authors seated in the auditorium. That’s a bold statement, I thought, wondering how many throats just swallowed hard, the great majority belonging to writers who probably weren’t blogging. It’s ironic how Laurie’s comment affected me, since I’ve been recommending the same thing since 2010 while maintaining two blogs during that time. One is dedicated to things related to self-publishing, the other is for anything else in the universe that I feel like writing about. And yet I’m still not sure how to quantify the importance of it; surely there’s no one-size-fits-all answer to whether an author should blog, how frequently to post or at what word count. These days when writers ask me for blogging advice, I revert to an “it depends” answer, although Ms. McLean may disagree and probably has ample evidence. Of course I believe a blog boosts an author’s online presence. One that functions well can be an author’s HQ, leading to everything else the world might want to know about her/him. The social media and book links are there, the updates and events, the musings, sample chapters, maybe some photos and video. But is a blog essential? Can one manage with just Facebook and Twitter, or perhaps by simply writing great books? If you don’t have a blog already, it’s important to know they can drain your time and energies. For newbies, there’s a significant learning curve to make the most of the tech involved. But even after the posts start piling up, building an audience takes time, and you may be blogging to crickets for months on end while only spammers leave comments. In worst cases, blogs can feel like a burden with no measurable reward. 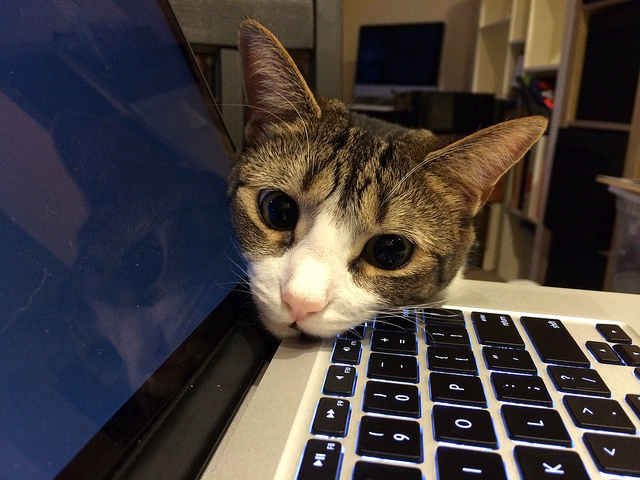 You may even question if the blog is helping you or hurting you as an author. After the lecture and standing ovation, I asked Laurie if she would expand on her comment. Since she’s landed lucrative publishing contracts and has been in the writing business far longer than WordPress or Blogger, I took her reply to heart as an agent who understands many aspects of publishing that an indie author like me may never know. 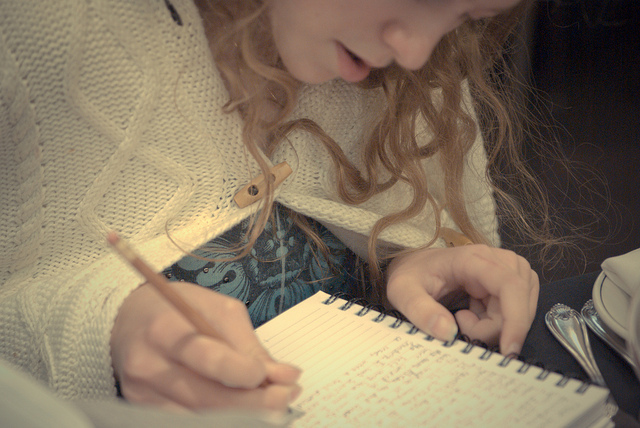 I have to agree because this is the crux: blogging gets you writing. Authors need that as athletes need exercise and musicians need to make music. And it doesn’t have to be the same kind of writing we do for our books. Blogging can an athlete’s cross-training or a musician’s jam session with friends, where we work on different muscles and skill sets knowing it benefits the whole and makes us better at what we do. That’s why I love my “anything in the universe” blog, where the most popular posts often have nothing to do with the subjects of my books. These cross-training posts are just stuff I find interesting and want to write about, like the life expectancy of NFL players. Author platform boils down to online presence. Each element adds to the big picture (i.e. Facebook, Twitter, website, Amazon Author Central, Google Plus, YouTube), but having a blog is the crème de la crème if used well. Nothing else has the same potential as a blog used consistently over time, plus all those other elements can be implemented into it. People from all over the world routinely visit my blogs from posts written years ago, and these visitors arrive from thousands of different Google subject searches. For example, this morning someone visited my blog from a post I made in May of 2011 while plenty of others visited posts written at least two years back. Nothing else I do online has that kind of lasting power. Facebook, Twitter and Google Plus mentions come and go like paper flyers taped to street signs compared to the perpetual billboards of blog posts. If you like the concept of more bang for your buck, then blogging will reward your cyber investment better over time. In 2009 I recoiled at the thought of having a blog, not knowing exactly what one was and dreading another thing in my life that required maintenance. It sounded like work, and I didn’t know if I had time for it. You may feel the same way. Understandable. A Facebook friend summed it up by saying, “When I started out, I was scared of the site as I’m in my senior years and learning it nearly gave me a nervous breakdown. But now that’s a distant memory.” Like her, I also came to embrace the learning curve and even excel at it. The good news is how user-friendly these things have become. How Frequent, How Many Words? Here comes the real divide. Some advice says blog as much as you can, several times a week if possible. Others tout quality over quantity with more developed posts winning out in the long run. My belief is to blog however it fits into your schedule. As a reader, sometimes I prefer short messages with immediate gratification while other times I’m willing to delve into a topic. It’s smart to write both ways too. For those who fear the burden of regular, well developed posts, you can allow select others to add articles in the form of guest-blogging. That’s good advice though I haven’t always followed it. On one of my blogs, I post about once a week. On the other, closer to once a month. This method doesn’t cause me to stress over them, which helps stay sane. The most blog-induced stress I’ve experienced was when I posted every day for a month as an experiment, attempting to make the posts as interesting as possible. That was a writing challenge comparable to NaNoWriMo. By the end of the month, I was spent but the results were remarkable. Visitor traffic had more than doubled as did the number of subscribers. My experience has been a mixed bag: the non-fiction blog sells non-fiction books better than my anything blog sells novels. This estimate is based on the number of Amazon links that get clicked by visitors, a helpful stat to monitor. A smarter approach is to think of them for building an audience and networking, and not to value them based solely on book sales. The free platforms at WordPress.com and Blogger are fine choices for authors on a budget. There’s no monthly hosting cost, but it’s wise to purchase a custom domain name at around $10 per year. WordPress.org is an upgrade for those willing to pay for more template options and monthly hosting. Also many websites have a blog tab or function enabling you to create a blog and website in one location. social media buttons for retweeting on Twitter, sharing on Facebook, Google Plus, Pinterest, etc. Every author has different needs, time frames and skill sets. Like Laurie, I believe every author can benefit by having a blog, but I don’t think every author needs one. If you have extra time, want to improve your writing, want to bolster your online platform and are in this for the long haul, then yes, you should be blogging. If you’re writing to satisfy another goal and not sure how important it is to you, blogging may feel like a burden you don’t need. Or you may have limited time and the ability to write amazing books, which people read and share with others (the ultimate goal). In that case, you probably don’t need one either. By the way, thank you to Laurie for letting me share these insights. She’s at Fuse Literary and knows her stuff. What are your thoughts? Please share in the comments. 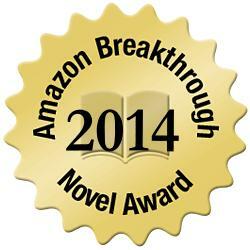 Ready for 2014 Amazon Breakthrough Novel Award Contest? It’s January. That means the annual Amazon Breakthrough Novel Contest is right around the corner. ABNA Grand Prize is an advance of $50,000 and a publishing contract with Amazon. How did that work out for last year’s winner, author Rysa Walker of Timebound? Her book has well over a thousand reviews and is still the #36 best selling paid book at Amazon. Sounds like it’s doing pretty well. Four First Prize winners will also get an Amazon Publishing contract and a $15,000 advance. There are other prizes as well but you must enter between Feb 16th and March 2nd–only 10,000 entries, which should go fast due to the explosion of Indie author books. Amazon Publishing will be tremendous exposure, plus it will get print books into bookstores. Factor in the international Amazon expansion that’s going gangbusters–well, you get the picture. Open to new books and previously self-published titles provide you maintain worldwide distribution rights. Click for FAQs. Genres include: General Fiction, Mystery/Thriller, Science Fiction/Fantasy/, Horror, Romance, Young Adult Fiction. You must register at CreateSpace.com/abna to enter the Contest. 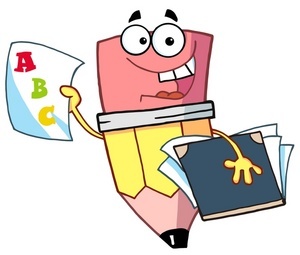 Once you have registered, follow the instructions on the entry form and upload: (1) the complete version of your manuscript that is between 50,000 and 125,000 words (“Manuscript“); (2) up to the first 5,000 words, but not less than 3,000 words, of your Manuscript, excluding any table of contents, foreword, and acknowledgments (“Excerpt“); (3) a pitch of your Manuscript consisting of up to 300 words (“Pitch“); and (4) the personal information required on the entry form. (1-4 collectively, an “Entry“). We will not review any Entry that does not comply with these Official Rules. The ABNA contest is open to unpublished and self-published novels. Authors can submit their work in one of the following categories: general fiction; mystery/thriller; romance; science fiction/fantasy/horror; and young adult fiction. For complete eligibility details, review the Official Contest Rules. No fees to enter, a nice feature for a book contest imo. What are your thoughts? A novel approach for an ebook business? It appears Screwpulp has one. An innovative platform may benefit new authors and readers alike. All books begin as free downloads then go to $1 after receiving 25 downloads. Will they go to $2 at 50 or 100 downloads? We’ll see soon as they are a fledgling company with a current best-seller topping the charts at 30 downloads. However, that will change quickly. My curiosity wanders to the price ceiling, which might come into play around the $3 or $5 or dare I say $7 to $9 mark. Will be fun to watch. But even for the $1 sales–at 75% royalties to the author, that’s good money compared to major retailers. I asked Richard Billings, CEO of Screwpulp, how it all began? I came up with a form of the idea about 3 years ago and inadvertently did customer discovery by speaking with readers and writers for a couple of years, which helped me to define Screwpulp to what it is today. We listened very carefully to both sides in order to create a marketplace that would be beneficial to all types of readers and writers. Our company was officially formed in February 2013 and launched in beta on May 1st 2013. I am the original founder with Will Phillips Jr., our designer, coming on in July of 2012. I found through my discovery process that design was important to both readers and writers. We brought on Richard Batt for business operations, and Kris Spencer for development in Feb 2013. More recently Joe Wikert, a 20 year publishing insider who has spent the last several years focusing on change in the industry, joined the team as a board member and mentor. I’m an amateur writer and found several problems with self-publishing model. Also, like the rest of the team, I’m an avid reader. As a reader I found that most self-publishing sites weren’t very user friendly or visually appealing. They sold books by authors I didn’t know, with no ratings to base my decision on, for higher prices that I was willing to spend on so many unknowns. Our motivation is to make the self-publishing experience better for both the reader and the writer. What sales growth are you seeing? We launched on May 1st with 4 books, 4 authors, and of course 0 users. Today, nearly six weeks later, we have about 50 books, 45 authors (from 3 countries), and we’re approaching 800 users. This growth has been mostly organic as we done very little marketing. Not bad to start. That will change dramatically soon. Where do you see book prices eventually rising to? That’s hard to say. So far there hasn’t been a mechanism that allows the market to decide what prices should be. We think our crowd-driven pricing will give real indications about what readers are willing to spend on self-published titles. How do authors upload and in what format? Is your Facebook Group suddenly getting way more traffic or requests to join than normal? Are 30 newbies in line to be added today, and normally that total is 2? If so, you’re not alone. Once again Facebook changes have come about. FB is recommending areas of interest to users based on what they’ve been doing and joining (ugly yellow arrows). Smart idea? Probably. Group recommendations make sense although the new influx might overwhelm you, especially if you prefer doing a little research to cut down on the fly-by-spammer types. 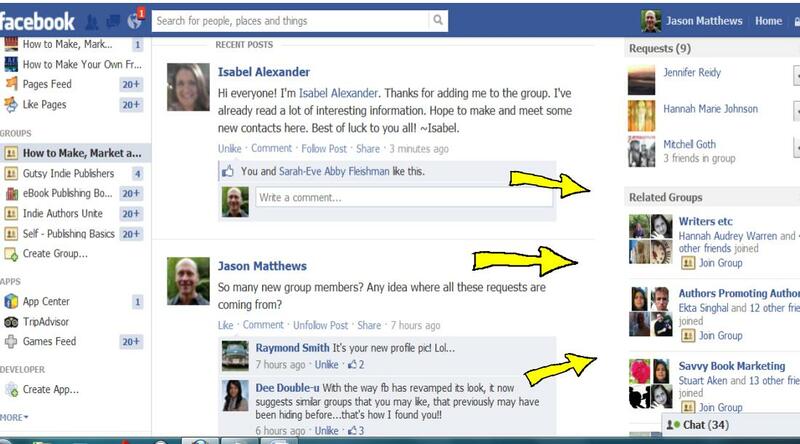 How to avoid Facebook Group spam? Check people’s profile. If they just joined FB last week and are in 13 groups–not a good sign. If they only have one photo and no comments–not a good sign. If she’s smoking hot and you can’t understand why she’d want to join your group–not a good sign and she’s not really the girl in the picture (probably not even a girl). Have fun, enjoy the bigger party. But don’t let these newbies waltz around thinking they can promote every one of their products and websites. Take a stand–this is your house. Subscribe to this blog for updates for indie authors and self publishing. 1. Amazon KDP. A+, love the subtle changes to their preview mode, still with the ability to both download the converted document or to view the newly enhanced on-screen version with Kindle options and working hyperlinks–very nice and fast. Available in the Kindle store in about 6 hours. This company has always done the most to sell ebooks and help me do it. 2. CreateSpace. A , the interior digital proof and final proof including cover design are miles better than years past. I love this company for paperbacks. Proofs went through in about 12 hours online and a physical copy delivered to my door in 3 days at the slowest shipping speed (because I chose to order a copy). Used to take a week. Fine quality and price is fantastic, can’t be beat by LightningSource or Lulu. Only wish they did more to proof the cover design online before submitting and perhaps add interior template options. 3. Smashwords. A-, some of this is my familiarity and loyalty but they still do a great job and give LOADS of advice on self-publishing. I wish approval times were faster for Premium Status, but it has sped up to around 24-48 hours compared to several days in the past. Also it can be a grizzly bear passing meat-grinder for newbies, but indies should learn proper formatting. SW is doing everyone a service by keeping formatting standards high. 4. Kobo. B, they have a great way of handling uploads for cover, description and content, but their Previewer needs work to get past the B grade. Don’t like the required download to view on Calibre or some other method–Kobo, keep up with the others and create an online Previewer. Props to them for more monthly sales than B & N, a pleasant surprise. 5. NookPress. B-, my first time uploading since the change from Pubit. Definite improvements with the ability to edit within their system and working links in Preview mode and an improved online Previewer. Still not as sweet as the way Amazon handles TOC but getting better. Needs improvements with the Editorial Review department, couldn’t get that to work right or to just delete it altogether. Now if they could fix their Nook Store search engine and get sales going (a long story), which is still affecting their overall grade. 6. Draft2Digital C+ My first experience with them and mixed feelings. Love how they’re attempting to simplify approval for authors without formatting experience, but does it currently come at a cost to those of us with experience? Maybe, maybe not. I’m only distributing to Apple through them and have been watching my book in Publishing status for a week now, assuming it will be distributed to iTunes soon. Excited for the promise of “real time” sales reports. Jury still out on this company but since they’re new, that’s understandable. Wishing them the best. Besides the biggies, I upload to my own websites for direct sales (pdf, epub, mobi) and give that an A+ at both Webs and Yola. So easy and nice to sell books via PayPal. I may update the samples at Scribd and other venues but doubt to upload again to Google Ebooks-Partners-Play, not even sure what they’re calling it theses days.